Yes, my dogs have the dumbest names ever. People sometimes ask me if my children named them. No. Sadly, I do not even have that excuse. 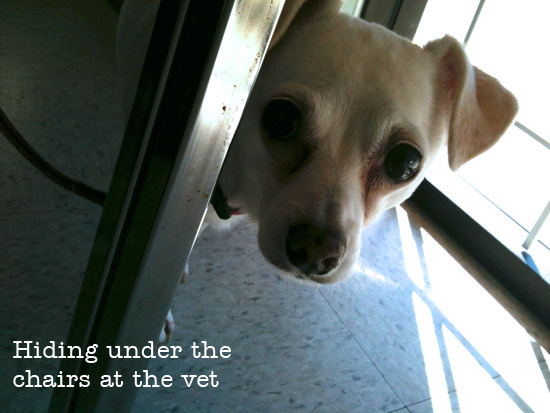 “Sparkle” was the name the rescue organization gave my little white dog – the Chihuahua-Jack Russell mix. We call her Princess Sparkle. Spark-o-lina. Sparks. Sparkler. Baby Boobalinas. All kinds of ridiculous names that are all equally embarrassing. I’m not, however, embarrassed to admit how much I love this little dog. When John (A Cagey Beard) & I brought her home a few years ago, she immediately snuggled in between us & rolled on her back so we could rub her belly. She’s the cuddliest, most affectionate dog I’ve ever had. Whether I leave for hours to go to work or I leave for a few minutes to go to the mailbox, she’s SO EXCITED to see me when I walk in the front door. You just can’t put a price tag on the amount of joy she brings to my life on a daily basis. Luxating Patella basically means that her knee cap doesn’t stay in place. 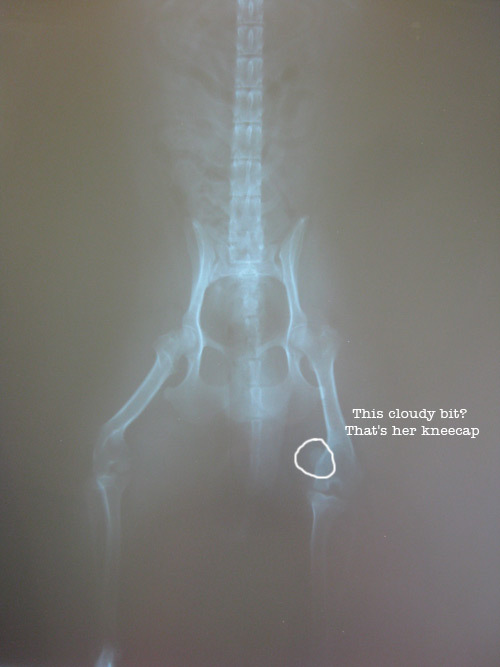 If you look at your own knee, you can see the way your knee cap sticks out, straight above your leg bone. Imagine if your knee slid off to the side. There are ligaments & muscles there that can keep the leg somewhat stabilized, but if your knee keeps popping in & out, it eventually grinds the joint down. So instead of staying cupped in place like a ball in socket, the knee actually sits outside the joint permanently. Aside from being painful, this also causes arthritis & all kinds of problems for dogs later in life. So with grade 4 luxating patella on her right leg & after years of research & keeping an eye on her mobility, I finally decided to take the plunge & pay for surgery to correct it. The surgery involves deepening the groove of her knee socket & wiring her ligaments tighter so it stays in place. Following surgery, she goes in once a week for a cartrophen injection which serves to lubricate her joints & cartilage. Pingback: Save the Princess SALE!